A survey of Wildean archaeology would reveal the gravelly grovelings of Sherard and Harris, a strata or two of Ellmann’s rocky research, and a media mosaic of “likelys”, “probablys” and “almost certainlys”. Not exactly a surefooted way for the modern literary traveler—but rather a crazy paving upon which the partially sighted have too often led the blind up the garden path. The reason for this plea to tread carefully is that the road seems to be deteriorating. It is a phenomenon fueled largely by the ability of the Internet to propagate misinformation, which is then picked up by a latter-day fifth column receptive to careless talk. Unfortunately, among their number are professed scholars willing to pass off Chinese whispers as gospel. 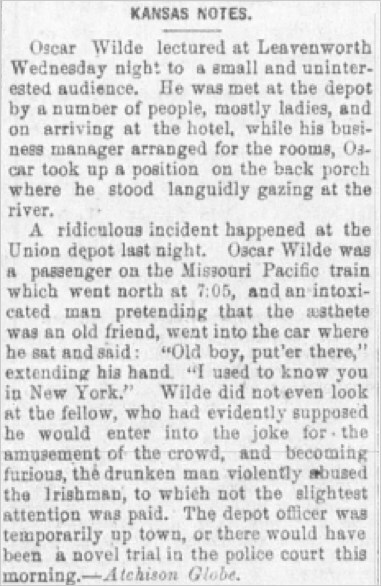 A recent example is the flawed Declaring His Genius, Oscar Wilde In North America, by Roy Morris, Jr., a pseudo account of Wilde’s 1882 lecture tour, which I reviewed here and for which I have compiled a list of errors and omissions. In this exercise I often found myself empathizing with a nameless Irish friend who, upon hearing tenuous assertions during lectures or walking tours, seems perpetually on the edge of yelling “Prove it!” — the question being: would it stand up in court? There was an amusing defense of hearsay evidence at a recent event of the Oscar Wilde Festival in Galway when we visited an eccentric Irish country house where the young Edward Carson used to take his holidays. Such a defense may not be legally admissible anywhere except in the Santa Claus courtroom of The Miracle on 34th Street but it did neatly double as a warning against another venerable principle: that proof isn’t necessarily a prerequisite to an idea taking shape. This led me to two thoughts. First, that the words genial and eccentric were quickly becoming interchangeable, and second, how many other famous people could also lay claim to not having visited the house? An idea grew that there was only one thing worth celebrating more than visiting a manor such as this, and that was not visiting it. If this is true then maybe outcasts do not always mourn and there is some reward in the Wilderness after all. It is a comforting thought, and not only to the soul of Oscar Wilde, because I miss a lot of events myself simply by not being invited. Speaking of historic homes, all this is reminiscent of a cliche associated with many American inns and private houses which asserts that ‘George Washington Slept Here.” No one is fooled by that either. The American public has long since recognized that the evidence for such presidential sleepovers is usually flimsy at best or non-existent at worst. Such pragmatism might have been schooled by the comedy George Washington Slept Here by Moss Hart and George S. Kaufman. In the 1940 play (and 1942 film starring Jack Benny) the characters struggle to substantiate the claim until the family dog unearths a letter on the property actually written by George Washington, thus saving the day and restoring the value of the house. The lesson of the story is that bona fide history needs to be based on digging up primary sources, and the fictional nose for Washington evidence is a good example for nonfiction hounds. Research used to mean microfilm reels, dusty corridors, and the one library a thousand miles away which happened to have book you want. Fortunately, nowadays dig means digital. These accounts were written by correspondents who met Wilde, attended his lecture, or interviewed him at his hotel, and whose reports appeared in the local newspaper at the time. As such, they fulfill the main criteria of a primary source: that of a published, believable, first-hand account. One’s first duty is to think, and who better to turn to for advice on that subject than that self-evident thinker Descartes, for he is attributed with coining the Latin expression de omnibus dubitandum — be suspicious of everything, doubt everything. Let us apply these principles to the bookends of Oscar Wilde lecture tour in America. Everyone said (and by everyone I mean anyone who has recorded the visit to America) that Wilde’s final lecture of the tour took place in October 1882 at St. John in New Brunswick, Canada. However, access to the primary source of newspaper archives now shows that Wilde lectured again at Yorkville, New York in late November. Similarly, everyone said (and this time I do mean everyone) that Oscar Wilde told a Customs officer he had nothing to declare but his genius when arriving at New York. The truth is that there is no primary source evidence to corroborate Wilde’s remark, a thesis I first put forth in 2002 and which is updated here. Indeed, returning to the subject of bona fides I have a bone to pick with Martin Fido for repeating the odious St. John Ervine’s shaggy dog tale which invented an equally spurious reply supposedly made by the Customs officer. One of the first Wilde biographers to take a skeptical approach was Rupert Croft-Cooke who devoted the first chapter of his The Unrecorded Life of Oscar Wilde (D. McKay Co., 1972) to unravelling what he termed “fables” produced by “a rigid crocodile” of biographers, whom he denounced variously as clumsy, pompous, and humorless eccentrics, mountebanks and honest fools. Following Croft-Cooke, perhaps more notably, and certainly more focused, was the Wildean scholar Horst Schroeder whose Additions and Corrections to Richard Ellmann’s Oscar Wilde is now well known. It was expanded in 2002 and remains essential to arresting errors from the major sourcebook. The theme of doubting biography continued when Merlin Holland provided the article that begins the The Cambridge Companion to Oscar Wilde, (Cambridge University Press, 1997) entitled “Biography and the art of lying.” In it Merlin accepts that early biographers lacked the tools and lived in an era when Wilde’s scandal and shame were still rife. But he also alludes to their “meat-cleaver” approach to the post-mortem study of his grandfather’s legacy in search of skeletons in the closet. He calls into question the sensationalism of trying to establish Wilde’s first homosexual encounter, and the conveniently transformed stories behind Wilde’s moment when “something clutched my heart like ice”. But as ever Merlin is even-handed, and along with being wary of the seductive use of footnotes, he concludes that Wilde’s life was elusive and perhaps he would have wanted it that way, a view that deserves to be the final word on speculative biography. If that proves so, it would leave the field of study to the empiricists. Three years ago I noted in my review of the conference: Who Owns The Legacy of Oscar Wilde? that Jason Boyd from the Department of English at University of Toronto, was compiling a genealogy of the written discourse on Oscar Wilde. In it he proposed to publish an online database to be encoded – or descriptively “marked-up” – with the aim of reversing the myth-making in Wilde biography up to 1945. Despite grants from the Faculty of Arts New Initiatives programme and the Humanities Research Council of Canada, results are still awaited. You will appreciate, however, that three and a half years is not a very long time in academic publishing. Another book which makes a forensic analysis of Wilde is Ashley Robins’ Oscar Wilde — The Great Drama of His Life: How His Tragedy Reflected His Personality (Apollo Books, 2012) in which the author combines a background in medicine and psychiatry with primary sources of prison, government and medical reports to provide new insights into the effects of Wilde’s imprisonment, marriage and health. More recently, Geoff Dibb has given us Oscar Wilde – a Vagabond with a Mission (Oscar Wilde Society, 2013), which impressively draws upon 25 years of original research into letters, memoirs, biographies, previously unpublished information and thousands of contemporary newspaper accounts, to bring us the first definitive study and painstaking chronology of Wilde’s UK and Ireland lecture tours. 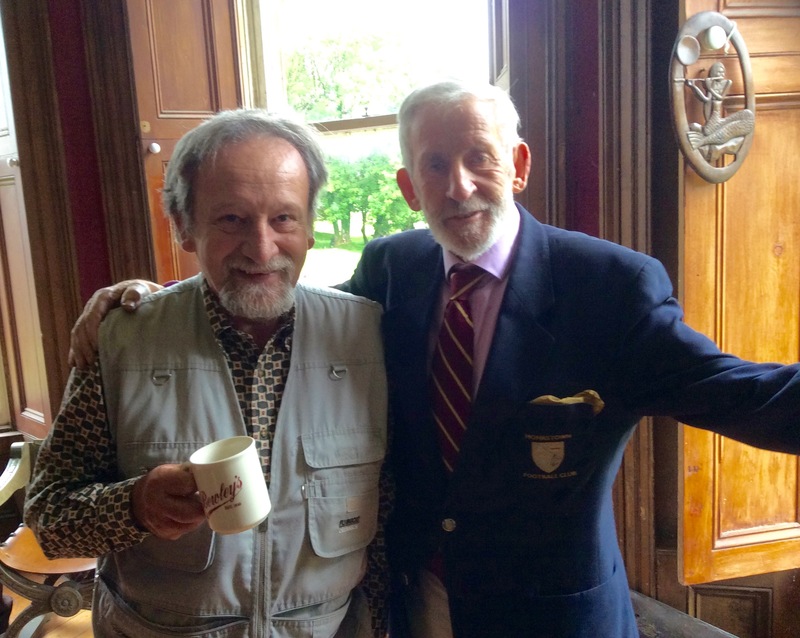 For more on Geoff’s research visit the blog of the British Newspaper Archive. Even more recently still, as I reported in this article last month, Michael Seeney‘s new book From Bow Street to the Ritz: Oscar Wilde’s Theatrical Career from 1895 to 1908 (Rivendale Press (2015) also employs much online research to uncover hitherto unknown productions of Wilde’s plays. For my part, my entire documentary web site Oscar Wilde In America is built on the principle of primary sources, as is my study Oscar Wilde On Dress which by definition required original research because it features a hitherto unknown essay by Wilde and a journey into uncharted territory, that of Wilde’s relationship with dress. Curiously, as important as the outward presentation of correctness is for future generations, I find an equally compelling reason for integrity to be found within. I conclude with two stories to illustrate what I mean. Last month I visited a UK National Trust house and was met by a guide who described the style of the building as William and Mary. No doubt it was. Probably, it still is. But my partially educated eye had begun to mistake it for Italianate. So I innocently (and genuinely) sought some clarification as to the architectural features which identified the style. But the guide, now shifting uncomfortably, confessed, “I wish you hadn’t asked me that,” admitting that the description she had given, (and had repeated two or three times), was simply the script she had to say. The style of the house had triumphed over the substance of the guide. Now, I have no wish to denigrate the laudable efforts of a volunteer, but the lesson should be clear: if you put yourself forward as a spokesperson you should be able to stand by your assertions, at least to the point of answering the most basic questions. We all start by borrowing and learning but if one gives a talk three times a week for five years, then there has been plenty of time to take some interest, not to say pride, in what you represent, and do some research. So much for the spoken word. As for the world of print publishing correctness perhaps matters even more because the wages of sin is permanence. I learnt a very important lesson that night: people believe whatever they read. Something magical happens once it’s put down on paper. They figure no one would go to the trouble of writing it down if it wasn’t the truth. Responsibility was my new watchword. So this article is a plea for that watchword, because, fellow scholar, as Eugene Jerome also concluded: “once you start compromising your thoughts you’re a candidate for mediocrity”. The definition of a Primary Sources used in this article is based on guides prepared by The University of Central Oklahoma and The University of California Berkeley Library. Great job, John, it’s a relief and a challenge to turn to you after peeping at the “news.” You have some great humor and/or wit in this essay, too. Bless you. A good example of much that you are saying is the story of what happened at the Bohemian Club repeatedly endlessly and erroneously in book after book. In a primary source, Dan O’Connell, who was there (One of the founders of the Bohemian Club) gives an entirely different and more interesting story. My mother, a Kirwan, said we are related to Carson who married a Kirwan. She also said we were related to Brendan Behan. Shall I shoot myself? Great job, Mr. Cooper. As usual I will save the email and read it again a couple of times. Interesting relevant articles in The Guardian on the day after Oscar’s birthday on Ted Hughes biography errors and Jane Smiley on history & historical fiction. The root of your concern lies with the Oscar Wilde tour of Galway at the recent festival: the guide, in lieu of fact, kept introducing Wildean information with formulae of the form: ‘we have no evidence that he was ever (at some Galway landmark) but if he ever had been it is almost certain that he would have seen yadda yadda yadda…’ This was both fatuous and hilarious by repetition. However, there is a broader issue here about what is acceptable as evidence in biography. For a Galway example: we know the Wildes arrived on the train at Galway en route to Moytura Lodge on the north bank of Lough Corrib. They would complete their journeys on the steamer from Galway to Moytura. Surely (the weasel word), some times (more weasels), they will have arrived late or too tired to take the steamer immediately and so will have stayed in the hotel overnight. It must be acceptable to say that the family, Oscar among them, will have known Galway reasonably well due to such visits? The point of all this is that, for many such activities there will be little to no evidence, yet is the biographer unable to use them? Or is it purely the need for acceptable formulations? I feel the minor examples I have mentioned may be relevant to a biographer and could be used justifiably as cultural background on Oscar. Does a biographer need several independent witnesses before these can be used? Or are those weasel words: surely, probably, almost certainly the (acceptable) ones we have to use? Dear Mr Dibb and I hope John gets this too. I enjoyed reading your response to John and though I am not a specialist like you two guys I felt Oscar must know Galway. I have read some of Sir William’s work. I enjoy reading you real scholars. Thanks Peter. FYI this forum is visible to anyone who visits the blog. What a tragic figure Hennessy was, I have just discovered. Good points, Geoff. Will get to them in turn. But first an observation, as one of the reason for my article was to help change the way our generation thinks about information. For instance, because of digital versions, your being online but having no books to refer to may one day become a non-sequitur. I hope not because, like you, I like to have print books. But even without owning ebooks it is possible to search them online. I do this all the time with Oscar Wilde’s letters, Ellmann, &c., as it is quicker than referring to indexes and leafing through pages. This is possible, because even if a book has only limited access online, the whole book is scanned and snippets of required information can be retrieved by searching. As for books in the public domain, almost all of these are online. As an example, here is Sir William Wilde’s book that you picked up in Cong, from which I see (using the search function at right not top) there are a couple of dozen references to Galway. I agree wholeheartedly about the Internet and books on it. The archive you referred to is an amazing resource let alone other sites. BTW the archive also contains lots of live music. I also carry a kindle on holiday and that can hold any number of books which, as you say, are searchable. On biography more generally, every biographer has a ‘line’ and they are not uninvolved or God-like in their impartiality. Everyone is biassed which, as a minimum, will affect content and descriptions- see the Ted Hughes lunch argument! While my comparison was between history and the ostensible history of biography, thanks for the reference to Jane Smiley’s piece for she brings the question of veracity in historical fiction. I shall reblog this post for those who haven’t followed this thread. A couple of points arising from your posts: I think Wilde was pretty aware of RLS’s writing and commented on it. Also DrJ&MrH is often quoted as a source for The Picture of Dorian Gray. On a general point you raise: complete falsehood – I am not a supporter!? Of course everyone makes mistakes but deliberate falsehoods to support a line to take cannot be allowed in biography. Oscar might not support that argument! It all started by hearing a Wilde quote in my teens. More recently I have published a book about Wilde’s lecture tours of the UK & Ireland: ‘Oscar Wilde – A Vagabond with a Mission’. Decades of research went into it. I’m generally fascinated by him and am writing something on The Portrait of Mr WH as well as researching Wilde’s links with radical politics and the supernatural. Keeps me occupied! Your colleagues distaste of Earnest may have been Wilde’s paradoxical lack of ernestness? ! Yes, Geoff, I think you’ve hit the nail right on the head. I will read your book before very long. I was deeply ensconced in Wilde’s poetry there for a while. One poem contained so many classical references – all of which I plan to look up on Wiki – that I consider it a classical education! I think it’s terrific what you’ve done – a real detective work and I am glad to have you to write to! Thanks again for writing. I’ve heard from the U. S. Naval Institute at Annapolis this morning to whom I sent a book proposal and they did not outright reject it – maybe I’ll join you guys on the book list one of these days. Your current research sounds interesting. You and John come up with original approaches. Let’s see “Mr WH” seems like I should know who “WH” is but it’s not clicking. Now – all of us – back to Oscar – (and family) – or whomever! Geoff. Could I have your email? garland1945@yahoo.com. Don’t worry, I won’t write that often. I don’t belong to Facebook nor do I twitter or whathave you! I was going to send the following to both you and John but could not so I copy it here for you. Hope you are having a good day. Lovely here in the Bay Area, weekend coming.Dear John, I’d like this to go to Geoff Dibb also but I don’t seem to have his email. I’ll copy it and send. This is in line with our standards. I’ve been studying a book, The Cradle King, a bio of King James I of England, as part of a project to write an article about the writing of the King James Bible. This bio is written by a Prof. Stewart at Columbia U in New York City who has previously published bios of Sir Philip Sidney and Francisco Bacon. The blurbs on the dust jacket praise the book to the sky and it has fairly high ratings on Amazon. However, as I was reading it I thought, ‘This is really snobbish. He quotes in toto James’s sonnet on the death of his Chancellor Maitland and I am able to figure out that it references Alexander the Great’s preference to have been celebrated by Homer rather than to have won all his victories and other classical figures (Minerva….) but I can’t help but think that much of his audience won’t have a clue. Then I am told that James I in a famous instruction to his son Henry instructed him to, Godlike, punish those who do good. This can’t be right! Sure enough I find James’s document on-line and confirm that this is a huge boo-boo in the middle of Stewart’s book. It seems evil. On the following page Stewart begins a sentence with the word “Who” where “Whom” would be correct, I believe. There is a photo of Stewart. He looks more like a football player than an author. I blasted him on Amazon Comments. I hope he hears about it. Such shoddy work by how many hands – author, editor, proofreader…. and then all this adulation from a mutual admiration society. Truly these are perilous times through which we tread.